The Wilderness Medical Society designates this educational activity for a maximum of 8 AMA PRA Category 1 CreditsTM. Each physician should only claim credit commensurate with the extent of their participation in the activity. 8 California Continuing Education credits are available for Emergency Medical Technicians and Paramedics. In addition to sections of the Arizona Trail, our mountain bike trip on the North Rim of the Grand Canyon includes a visit to Grand Canyon National Park and the highly acclaimed Rainbow Rim Trail. This mountain biking trail in the North Kaibab National Forest is one of our all time favorites. The construction techniques the rangers used to build this trail are the best we have found in the West. Because the grade rarely exceeds 9%, everybody feels like a hero. The climbs are gentle and consistent and the descents are smooth and flowing. And you can't beat the views of the Grand Canyon. This trip is the perfect way for intermediate mountain bikers to see one of America’s most spectacular National Parks! After our meeting in St. George, we will shuttle to the Kaibab National Forest, about three hours. Our ride begins south of Jacob Lake where we will start out with a good warm up on forest service roads. The van will meet us in a beautiful meadow along the way for lunch. After lunch we will pick up the Arizona Trail for an afternoon of fine singletrack riding. This trail covers 800 miles from the northern to southern state lines and was completed on December 16, 2011. This section winds up and down through the Ponderosa Pine forest, finally popping out right along the East Rim Viewpoint. From this point, we will get a dramatic view of the upper sedimentary rock layers of the canyon: the Kaibab and Toroweap limestones, Coconino Sandstone, Hermit Shale, the Supai Group and Redwall Limestone. These layers are exposed because of millions of years of erosion. Our camp for tonight and tomorrow night includes a natural terrace which is a great sunset viewing spot. Today we will do an out and back ride from camp on the Arizona Trail. After a short warm up on the dirt road, we pick up the fun singletrack and start pedaling through both aspens and ponderosas. There are lots of short climbs and descents in and out of beautiful meadows as we make our way north. There is a shorter option today where you can turn around at “the meadow” and a longer option where you can ride all the way to the corral. We pack a lunch today so you have the flexibility to fuel when necessary! Back at camp we relax with views of Marble Canyon far below us. John Wesley Powell, the first person to run the length of the Colorado River, named this part of the canyon for the polished rock exposed at river level which reminded him of marble. It is actually Redwall Limestone. This limestone is about 360 million years old and it was deposited when most of the continent was under marine waters. After packing up camp, we will shuttle into Grand Canyon National Park. We will spend the morning hiking on one of the park trails which will give us a chance to really explore the incredible sedimentary rock layers which make up the canyon walls. We will find many fossils along the way, evidence of the 250 million year old seabed. The trail follows the rim with expansive views of the canyon. Next we will visit the historic Grand Canyon Lodge. The lodge is one of two remaining historic lodges from the Grand Circle tourist route of the 1930s. Constructed from giant timbers, the porch suspends visitors over the walls of the canyon. We will shuttle back to the Kaibab Forest and ride a series of aspen lined dirt roads to our camp at Locust or Fence Point. 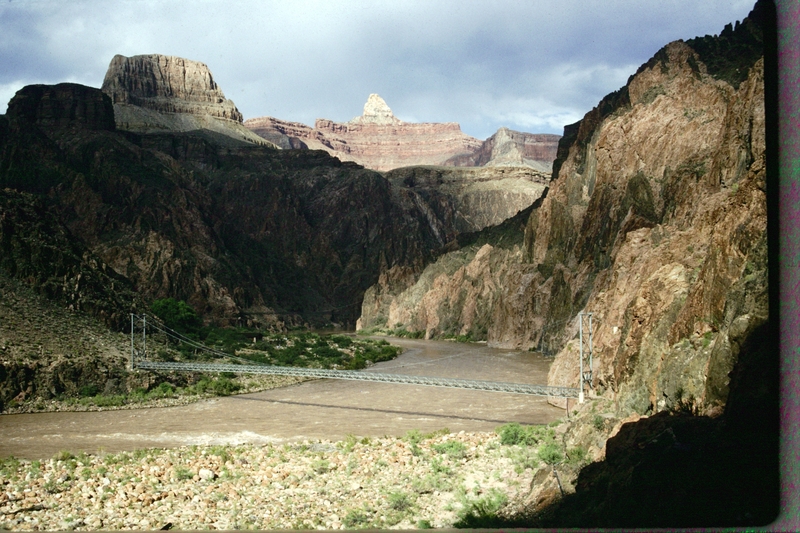 This evening’s views are classic Grand Canyon and give us a great look at its vast complexity. Below us lies almost two billion years of geology, from the younger Permian layers to the metamorphic and igneous basement rocks that comprise the Inner Gorge of the Grand Canyon. These are some of the oldest rocks exposed in the world. The singletrack we ride today, the Rainbow Rim Trail, is one of the highlights of our trip. It was designed and flagged by Ranger John Kneeling of the North Kaibab Ranger District. It took him three months to flag out the route and he made sure the trail never rose or fell by more than nine degrees. This means that the climbs are all very ridable and the descents are some of the most fun on any trip we do. The trail is 18 miles in length and we are camped at about the middle. Today we ride it as an out and back to the north, planning to have lunch at the northern most point, called Parissawampitts. We will pack a lunch and enjoy it trailside studying the amazing strata of the canyon. Of course you have the option for a shorter day and can turn around at any time. No matter what, we know you will love riding the Rainbow Rim Trail. Today we will ride more of the Rainbow Rim Trail, through the Ponderosa Pines to the south. This part of the trail is fast and smooth and still continues to wow with stunning views of the canyon. There are a few good climbs to wear out your legs on the last day, and an equal amount of swooping downhill to bring out a giggle or two. After our ride we will have a final lunch near the rim and load up for the shuttle back to St. George. We will be without vehicle support during many sections of the ride. Itineraries are subject to change due to weather, road conditions, rider safety, and other factors which may affect the logistics of the adventure. Road Surface: Variable; dirt roads, singletrack trails. Technical Difficulty: Moderate; singletrack is not very technical, climbing is minimal. Physical Difficulty: Moderate; singletrack is unsupported. Through lectures, hands-on sessions, and scenarios, you will enhance your medical training and learn to apply your medical knowledge to the outdoor environment. Josh Dubansky is a board certified emergency medicine physician at a busy tertiary care and trauma center, and is Clinical Assistant Professor at the University of Nevada School of Medicine (UNSOM). Dr. Dubansky received his medical degree from the University of Maryland, then trained in Emergency Medicine at UCSF-Fresno. There, he created and completed an Area of Concentration in Wilderness Medical Education, designed and implemented EMS field scenarios and mass casualty drills, and lectured extensively to medical students, EMTs, nurses, physicians, and National Park Service and U.S. Forest Service Rangers, and researched and wrote National Park Service EMS protocols as part of the ParkMedic and Wilderness Medicine Programs. He also helped design and implement a Tactical Medicine program for the U.S. Forest Service. Dr. Dubansky has taught for or helped run numerous outdoor programs, including NOLS, Cal Adventures at U.C. Berkeley, Cornell University Outdoor Education, California Canoe and Kayak, ARTA River Trips, Healing Waters San Francisco, and Boardsports Kiteboarding. He also spends time as a ski clinic physician and as a National Ski Patrol volunteer physician. He is a Wilderness Medical Society Fellowship Candidate and WMS DiMM Graduate.